Just a quick note to remind you of a few things coming up: This Saturday (9th February) the penultimate Dublin by Night event is on the Curragh, Co.Kildare, with a mass-start at 6.30 pm. Details here. Remember if you’re travelling from Dublin to allow extra time for the speed-limited roadworks around Naas. There will be two courses, of 1.9 km and 4.8 km and it sounds like a lot of fun! The final DBN event is at St Anne’s Park, Raheny, on Saturday 16th. 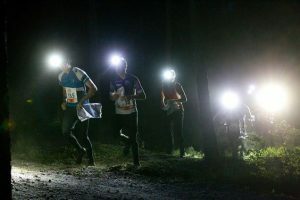 There’s no other Leinster orienteering on at the weekend but there are events in Cork, Kerry, Roscommon, Galway and Tyrone; the NI Score Championships are on Saturday at Seskinore Forest, near Omagh, and the NI Night Championships at Ecclesville Equestrian Centre, Fintona, on Saturday night, with a local event there on Sunday. IOA Funding increase: The sports grants were announced this week and the IOA’s allocation has risen from €45,000 in 2018 to €65,000 for 2019, which is very good news. Further good news is that Mary O’Connell is to fill the vacancy for IOA Chairperson which has been there since the 2018 AGM. Bad news, though, is that there is still nobody to take on the Junior Affairs brief, which is critical for the future of the sport. Leinster Championships entries are now open at Fabian4 here. The event is on 7th April at Strangely in the Glen of Imaal, Co. Wicklow, run by CNOC. Details here. … and while you’re looking at the Fabian4 website, you can click again to renew your 3ROC membership, or to join as a new member!